Stuff I have looked at and my thoughts! 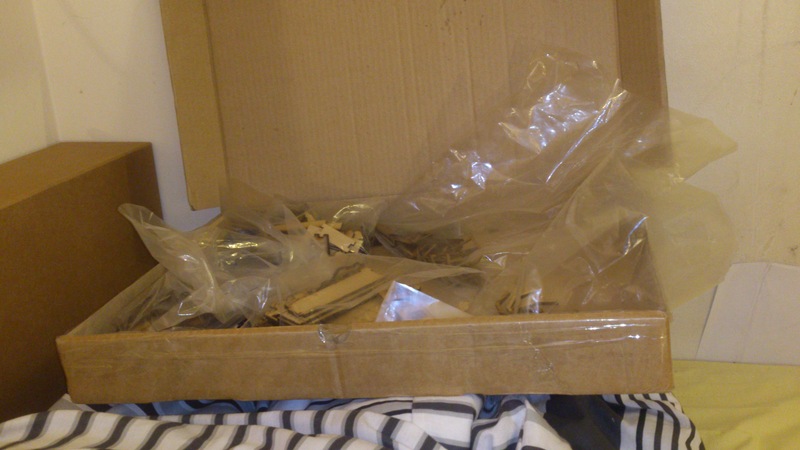 This package was gloriously large, and opening it has filled my house with the smell of laser cut MDF, something which has caused alarm more than once with my wife checking for burning items about the house. The first thing to state about Mad Mecha Guy stuff is the sheer level of reasonable cost. Compared to a lot of companies, you get a lot for your money. My purchase of the Small Military Base plus some raised walkways, which are not currently part of the catalogue. The service offered is excellent with great communication and, to my never ending surprise, they will do requests for whatever you want! I wanted raised walkways and mentioned this once I found out that he takes suggestions for future products. A few days later and we have collectively settled on a design and price. 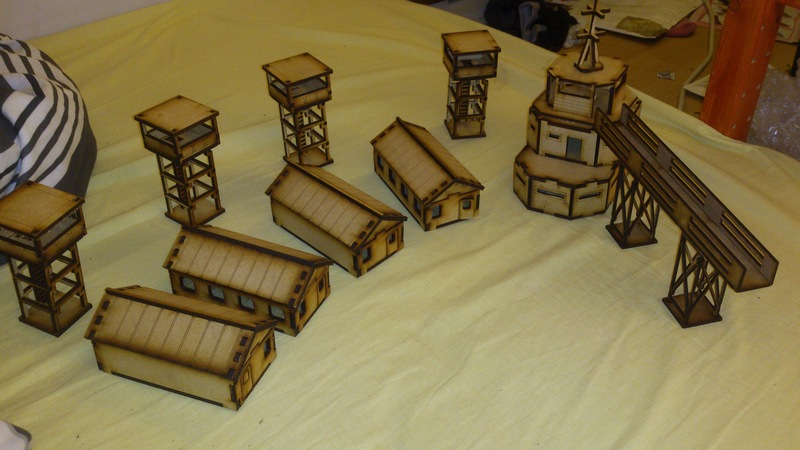 The small military base set sells for a low price of £20 plus P&P. With my custom walkways the cost was still under £40 and that included P&P! Not pictured, because it’s not been assembled, are 2 more huts, a vehicle shed, walls, gates and the rest of the raised walkways. This all together means you can very nearly fill a battlefield completely at a budget that will leave your wallet breathing a sigh of relief. The quality of the stuff is generally very good with little in the amount of cleaning needed. Just a few pieces had not quite cut right but only in the sense that the cut had not gone straight through the wood properly. This is easy enough to clear up with a sharp knife though. 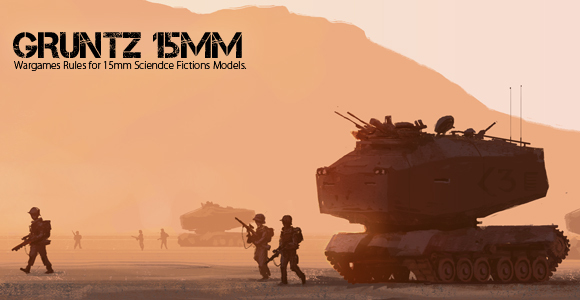 Gruntz is designed for you to put your own imagination to work, to come up with your own ideas and universes or adapt ones you love to the joy of 15mm gaming. That said Robin has given us a look at his imaginings of a universe with the Heliopause setting. The Gruntz book features fluff for a myriad of factions in the Heliopause setting as well as some history of the universe in general however there isn’t a lot. Personally I have not looked at this in depth as it is not a setting I’m making use of, so I cannot comment on the content but it is good that those not interested in the grey matter exercise of inventing such things can just use whats there already. I myself have devised a faction loosely based on the Covenant from the Halo universe. My Comrades have developed their own factions as well. At some point we’ll tie in how they encountered each other and build up our setting nicely into a thing! That is definitely part of the appeal to me. Not that we couldn’t have done this anyway but its easier when you can build your own units using the unit builder. In fact to play the game you will have to! or you will need to download pre-existing ones from somewhere. There are various locations but I would look to the Grunts forums first of all. A game that is designed to be generic needs a good way for you to represent your forces on the table. Robin has done a remarkable job with the unit creation side of things. List creation became a joy to me once more as I devised the tools of my opponents doom. I have seen unit creators that seem to require a mathematical and scientific mind that would make Steven hawking feel like an outright idiot. The Gruntz creator is simple enough for me to grasp so, quite frankly, anyone can manage it with relative ease. The balance that has been achieved thus far is fantastic. My helicopter gunship that seemed to be an absolute powerhouse was quite quickly dealt with by normal grunts I thought would achieve nothing. This happened through me underestimating what they could do and moving to close. Nothing is so ridiculously strong that it cannot be dealt with. This means you uber aircraft of doom will die to far cheaper fighters or AA fire if unsupported. It all encourages a very balanced army selection and leads to evenly balanced games won on strategy and tactics rather than pure luck (though its a dice based game so remember luck can skew things) Perkz and Modz are what you use to give your vehicles and gruntz special abilities to make them unique and vary greatly from defensive abilities like auto heals to more aggressive ones that allow 2 shots from your units guns. They add some lovely flavour to proceedings and help you bring your universe and its inhabitants to life. Smaller scales mean bigger stuff! Paradoxical! The rules for Gruntz are simple to master. Anyone with any gaming experience will pick them up with ease and even recognise some of it from other games. The mechanic is 2d6 based and works the same way as Warmachine, roll 2d6+your models stat and compare the result with the opposing defensive stat. Equal or higher gets you the hit/does some damage. There’s nothing revolutionary about the rules and this makes the game easier to pick up. Models get to activate in units one at a time, once activated the unit has 2 action points they can spend to move, or shoot plus other special rules may take up an action. A commander is needed to lead your forces and he brings some boost to your units of his own but losing him can hit your army hard as every gruntz unit must take a morale check wonderfully called “Condition Brown”. In the normal course of the game units can be suppressed, if they take heavy casualties they can suffer “Condition Brown” and flee, they can go into overwatch, go prone, the scope of detail is just great without being complicated. The one rule that does stand out is models being waxed before they die, its a mechanic that iv not seen before but takes things like saving throws gained from Perkz out of your opponents turn and into your own, upon activating a unit you remove waxed models, or use their perkz to remove the waxed condition personally I like the way this works as it helps the flow of the game to remain smooth and consistent. There are none. Sort of. 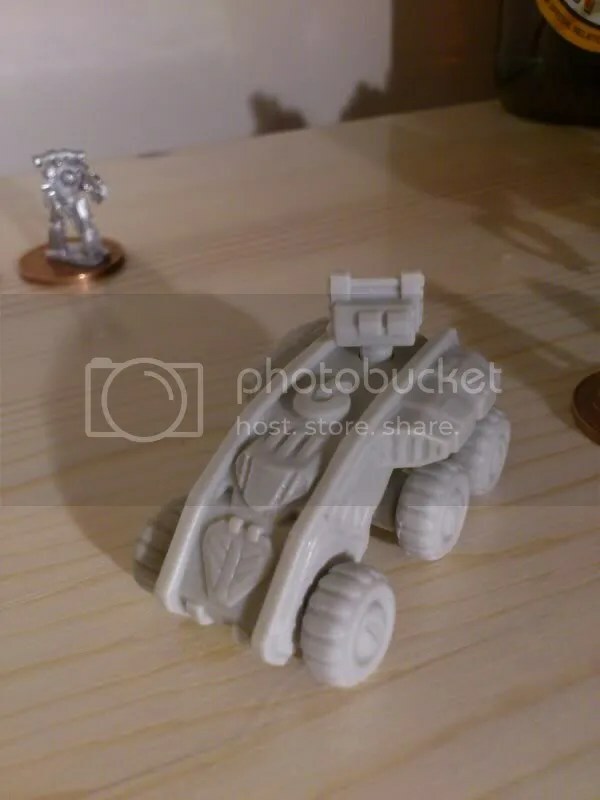 Robin has not released a miniature line for gruntz and all are encouraged to make use of the large number of manufacturers there are out there to use for your games. I can’t review them all for this so I will include my favourites for you as links below and some of the images are from some of the lines that are out there. Seriously though, there really are a lot. 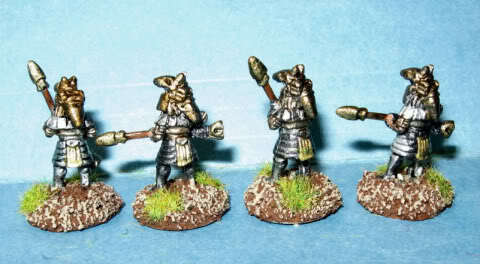 If you have never looked at 15mm gaming before you’ll probably be surprised at the number of them. Each time I search google I find another brimming over with funky stuff. If there is a sci fi staple you love there is someone producing something thats damn close, Alien, Predator, Stargate, you name it, someone has come damn close to making it. As far as the book goes, it is available in print form but buy it electronically from places like DrivethruRPG or WarVault and then any future updates to the rules can just be downloaded free! In conclusion I have to say that Gruntz only real restriction is your own imagination, cheesy as it is to say. It plays smoothly in just a couple of hours; is easy to learn; cheap to buy, both as a rulebook and in terms of miniatures, and outright fun. 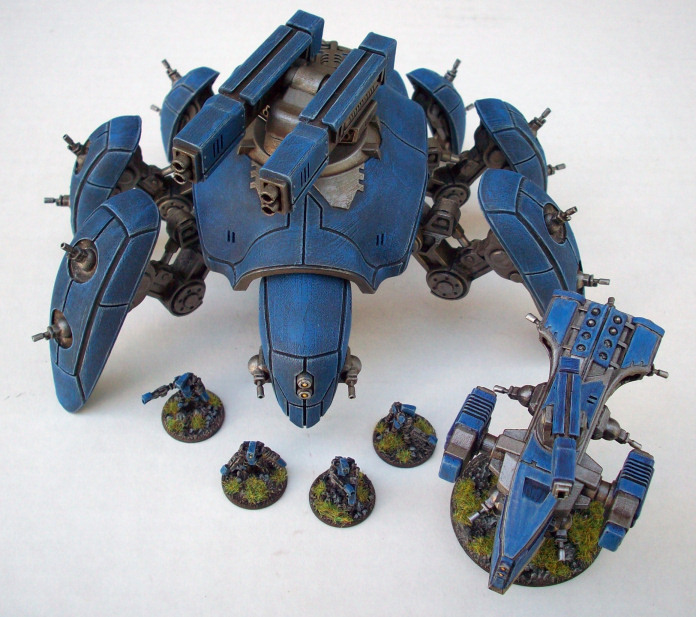 The requirement to design your own troops can be avoided easily, if that’s a sticking point for you. The only thing I would say is that this is not a tournament style game. Its very much more scenario based without being overly complex like some others can be. Basically, try it. It won’t break the bank to do so and I don’t think you’ll regret it. Your chairman commands you! Seriously though, there are tons of them. Unfortunately due to a family emergency I was not able to attend. To say this was gutting would be understating it massively. 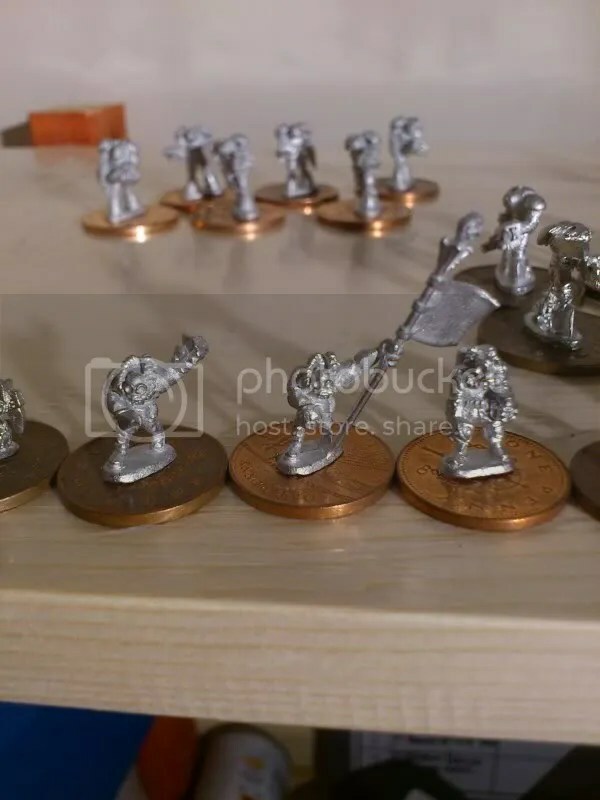 However My good friend Phil of The Shell Case with one of “The Chaps”, his gaming group, and 2 people from 6 inch move went along and spent a whole day trying the game as it presently stands and gave a little feedback and made some suggestions to boot. They have both respectively posted on their blogs regarding this so I encourage you to check out both. It is interesting that they both use the same game to compare Dropzone Commander to, having never previously met and not really communicated in a big way since going. Needless to say that they are good reads and should have you salivating for the release of the game! 6 Inch Move Post is here. First post from The Shellcase is here. With a follow up post here! 6 Inch move have also featured all the pre-order army deals for Dropzone Commander on their blog so why not check those out as well to see the goodies for yourselves! Comrades! As some of you will know I interviewed the creator of Gruntz (if not then check it out damn you!) and I have since then been given and purchased models to use with the game. 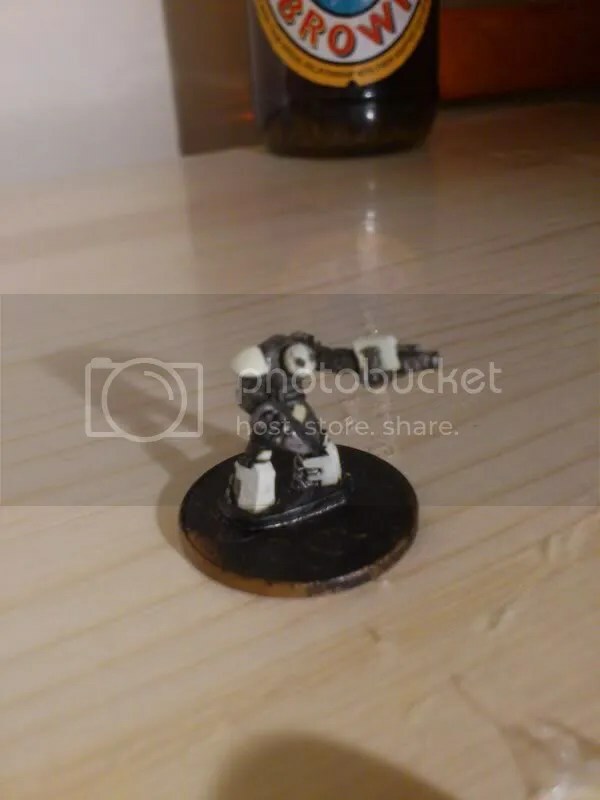 The models I have bought are from Khurasan and Critical Mass Games. Today I am going to show you what I have picked up from Critical Mass Games. At christmas my brother, in an uncharacteristic show of generosity, bought me one of the Gruntz starter sets, Specifically the Kaamados Dominion. So to that end I will be showing you what that means and what I have been able to do with it painting wise *cough* nothing *cough*. So first we have the smaller Squatmata. I have not read what producers Critical Mass Games had in mind when they created these fellows but they seem to be a fodder unit, lightly armed and armoured. The various model types of unit available in this range put me in mind of Halo’s Covenant, Squatmata being very much expendable troops, running around panicing waving their arms in the air just because something Master Chief shaped slaughtered their comrades, while the “next up” make the proper back bone soldiery of the Kaamados Dominion. Heres one I painted earlier.... Man thats a blurry picture! Sorry about the dark picture. looked brighter when I took it! This comes with several options to mount on the roof. A missile battery, an anti-infantry gun of some kind and what I think is the most over sized sensor suite possible for this small vehicle. That’s my opinion of course but that’s the whole point of this review! I just think something slightly more subtle would have worked better for a sensor suite. By comparison the weapons are fairly small, the gun I feel is perhaps lacking in “gun-like” details but this is a minor gripe, it’s sci-fi after all. How many moving parts would you see in a space alien laser turret? The missile battery works well enough for me that I can use them as anti-tank or anti-infantry missiles with little problem and other details on the buggy itself are pretty good. Tanks... ...for the memory! ...sorry. The resin tank is flipping massive! 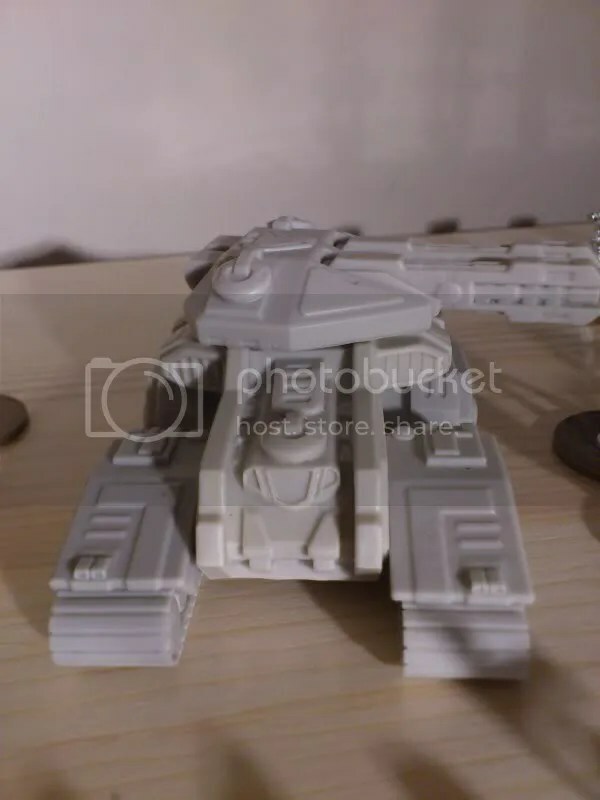 It came with the tank tracks as seperate pieces as well as the turret and dual gun barrels. It is, I suspect, supposed to be the equivalent to a heavy walker of some kind. Its appearance will be recognisable, clearly Halo is an influence in the CMG bunker. Where it differs is mainly the drivers window (seemed odd at first but my brain then said “Alien space technology window”) The turret is a wonderful thing as well. 3 options for armament exist here. Standard “Big Gun” barrels, Mini-gun type barrels or spacey high tech-ish barrels. I opted for these as I decided they could then be whatever I want them to be. Big gun barrels and mini gun barrels having definite target types in my head. Other details on the tank are reasonable, I kind of feel that CMG could have gone nuts with details on a model this size but I can see why they wouldn’t. It would visually overwhelm the rest of the forces and look out of place as a result. The casts on both vehicles are clean with little to no flash removal required. The only gripe is the buggy wheels. They were connected to some sprue by the tracks which took away some of the detail when I removed it. But placing them with this part looking at the floor covers it up. And that, is that. I realise my pictures are not the best and I intend to improve them at some point The peoples Camera is not yet ready. I will Maybe even paint one of the vehicles, you never know. For now though, why not check out Critical Mass Games full range and while you are at it, get the Gruntz Rules so you have something to use them with! Those magnificent men on the Shellcase machine, or Phil as hes also known, has posted another wonderful review for all you martial arts fans. Bushido is a skirmish level game thats full of eastern promise. Check it out, why not? Would you like to read more? I’m not stopping you! “This is my brief overview of me and my mates trip to Nottingham for the annual Forge World Open Day. We went last year so we kind of knew what to expect. We set off around 6:30am and arrived at half ten. As usual the retail queue was huge so we bypassed that and went straight to the display section. I didn’t really ask a lot of questions but did a lot of looking and taking photos so here we go! Chaos Dwarfs have been a dream army of mine for as long as I can remember and these two models are from the army list in Tamurkhan. They are the Skullcracker and Iron Daemon. I had a leaf through the Throne of Chaos book and it is amazing. The general look and feel is of such quality it was very tempting to buy it there and then. The Chaos Dwarf army is actually quite a small part of it, with the only core unit being the infernal guard, hmmm. Would you like to know more? then go Here. and look out for part 2! The Shell Case once again has a great miniatures review for you delectation. Go here to see the Goodies! Freebooters Fate is a 30mm Skirmish game with Pirates! It is also diceless! Something I have not done before it must be said and the thought of no dice is intriguing and scary at the same time!